Shop till you drop at Pacific Fair Shopping Centre and Harbour Town Outlet Shopping Centre. There's still lots to do: tour the pleasant surroundings at Surfer's Paradise Beach, admire nature's wide array of creatures at Currumbin Wildlife Sanctuary, get in on the family fun at Warner Bros. Movie World, and enjoy the sand and surf at Burleigh Heads Beach. To find reviews, maps, photos, and tourist information, read Gold Coast trip builder tool . If you are flying in from Singapore, the closest major airports are Brisbane International Airport and Gold Coast Airport. 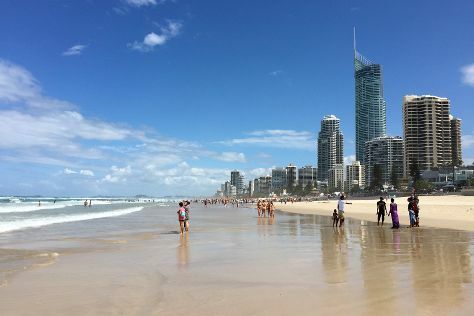 In November, daytime highs in Gold Coast are 30°C, while nighttime lows are 20°C. Finish up your sightseeing early on the 26th (Mon) so you can travel back home.